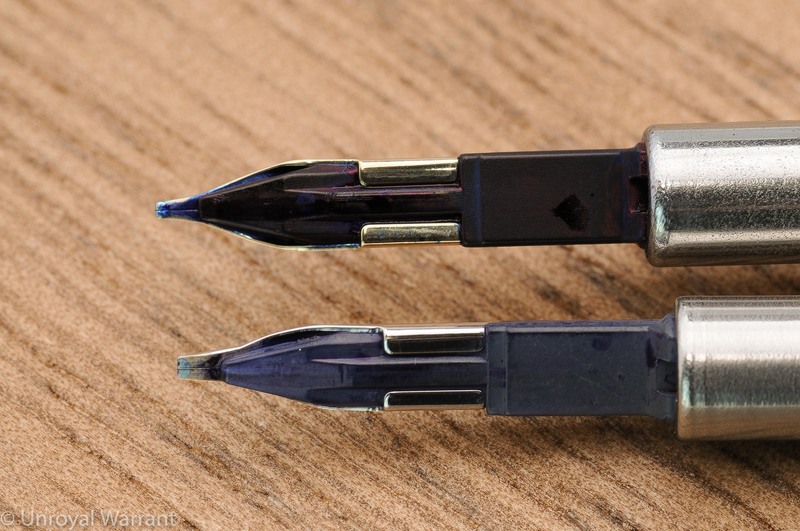 Pilot’s most famous fountain pen is without question the Vanishing Point (aka the Capless). 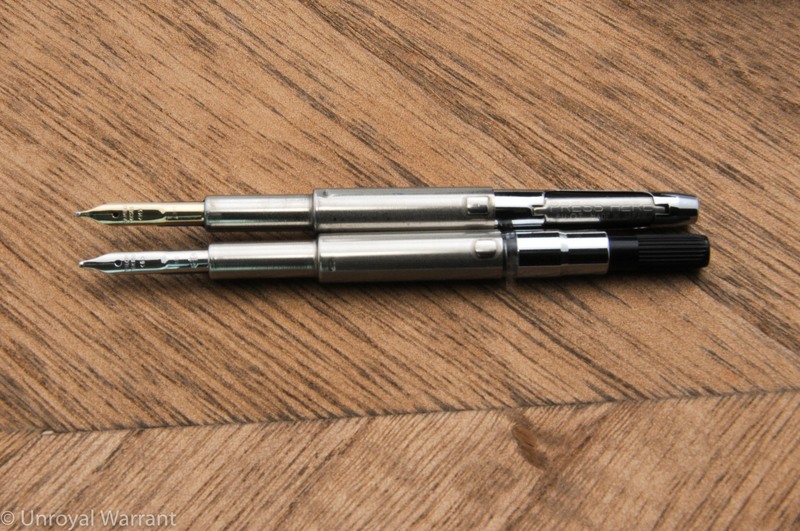 This is the best selling and simply the best retractible nib fountain pen ever produced. 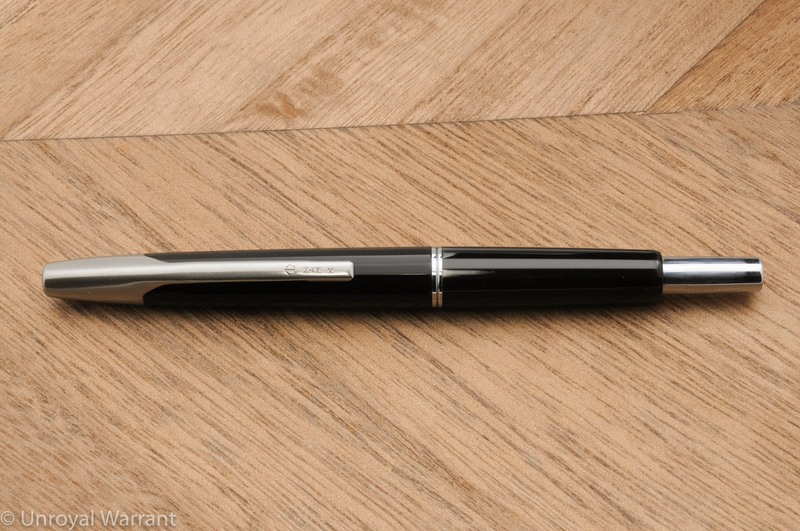 Many models have been introduced since the Vanishing Point’s inception in the early 1960s and the one I am reviewing today is a “Namiki” branded model with a faceted black plastic body and white metal trim. This body style was introduced in the 1970s stayed in production until the late 1990s. This particular Vanishing Point was made in 1997 right before the introduction of the current metal bodied Pilot Vanishing Point in 1998. This older model (which I will refer to from now on as the “faceted VP”) is much more attractive with its elegantly integrated clip and slimmer faceted body. The current Vanishing Point has a much less harmonious design with bloated clumsy look to it. The faceted VP is lighter and slimmer, weighing in at 18.5 grams and measuring just 11mm wide (clip not included). The current model weighs in at 31 grams. To my hand the faceted VP is much more comfortable to use. 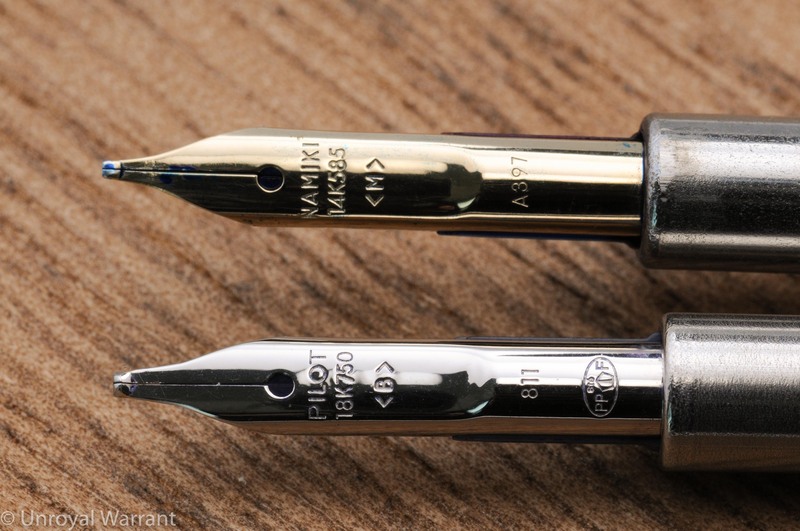 The nib on this faceted VP is 14kt gold instead of 18kt gold on the current production model. 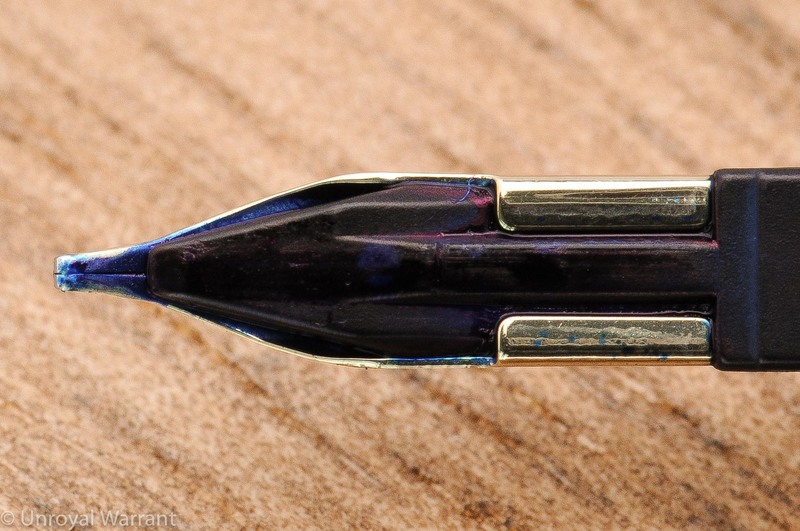 The nib started life with a medium point and was ground into a butter line stub by Pendleton Brown. This particular grind offers a great combination of usability and writing flair. I have done a number of custom grinds on medium nibs and this one my favorite so far. 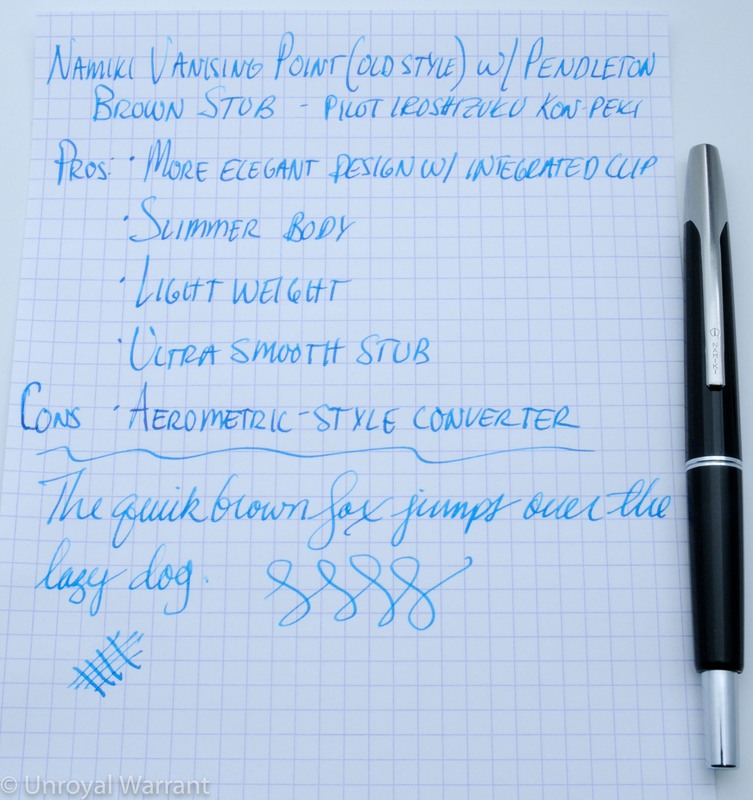 The nib is so smooth with just a hint of feedback…it’s luxurious. The converter. These faceted VPs use a squeeze sac converter. It doesn’t hold enough ink so I always use cartridges with the metal cartridge cap. The current model by comparison uses the Pilot Con-50 which is nicer to use and holds a slightly more reasonable amount of ink. This is an awesome pen. You can find them used ranging from about $80 to $150. Awesome faceted VP!! where did you get yours? Thank you kilroynb for your comment! I got mine from the Fountain Pen Network Classifieds.